So, I totally didn’t plan this. It’s kind of funny, because when I decided that I wanted to do Peach Week, I started writing down all sorts of ideas in my trusty notebook. The list was getting longer and longer, and I knew I had to narrow things down because I only had 6 days to work with. So one by one, things got scratched off, until I was left with 6 recipes. I started cooking. And then yesterday, I posted the Peach and Coconut Cobbler that I made. 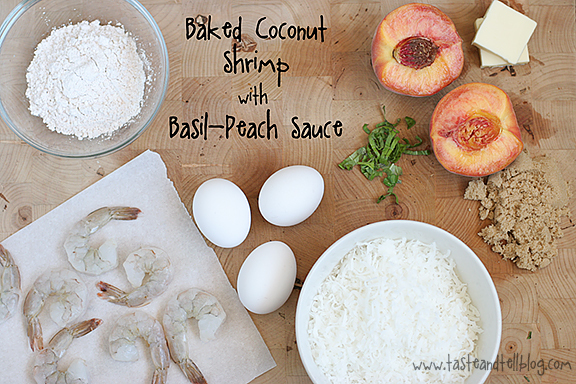 And then I went to type up today’s recipe, and realized that I am using the peach/coconut combo again! It must be a craving I’m having right now!! 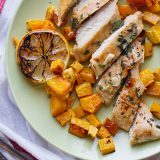 This recipe was one that popped into my mind first when I thought of savory meals with peaches. I love coconut shrimp, but the only kind I’ve ever had is the fried kind. 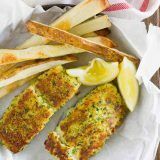 And not that I don’t like the fried kind – because I really do – but not only is this version much better for you, but it seems like a lot of people are afraid of frying. So it’s much easier, as well!! 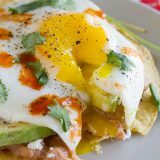 This was such a simple recipe that has tons of flavor. And I totally would have thrown some chopped jalepeno into the peach sauce if my husband wasn’t such a jalepeno hater. But I think it would have been awesome! And a bonus is that this sauce sets up decently in the fridge, so if you have any leftover, it makes great jam for a pb&j the next day! In a medium saucepan, combine the peaches, butter and brown sugar. Cook until the butter has melted and the peaches start to break down. Use a potato masher to mash the peaches. Cook the sauce over medium heat until slightly thickened, 10 to 15 minutes. Once thickened, remove from heat and stir in basil. If you want a stronger basil flavor, use 1 tablespoon, but if you want the basil flavor more muted, only use 1/2 tablespoon. Preheat the oven to 400F. Place a baking rack on top of a baking sheet and set aside. 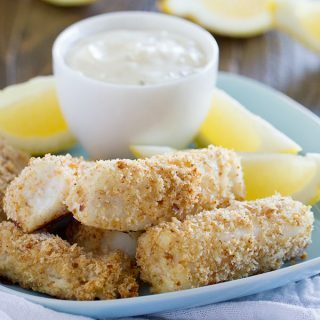 In a shallow bowl, combine the cornstarch, salt, paprika and cayenne. Put the egg whites in another shallow bowl. Place the coconut in a third shallow bowl. Holding a shrimp by the tail, dip it in the cornstarch mixture and coat the shrimp. Tap off any excess. Dip into the egg white, then into the coconut. 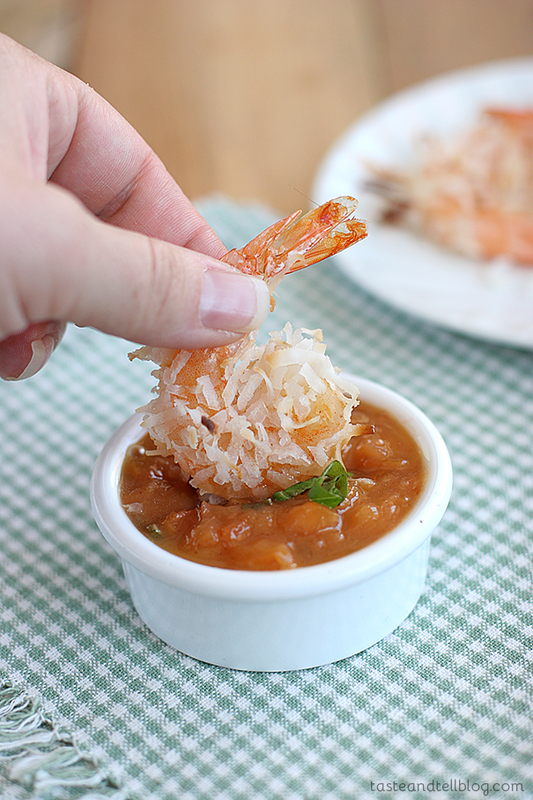 Use your fingers to press the coconut into the shrimp. Place on the prepared baking sheet. Repeat with the remaining shrimp. Bake in the preheated oven until slightly browned, about 15 to 20 minutes, flipping over once. 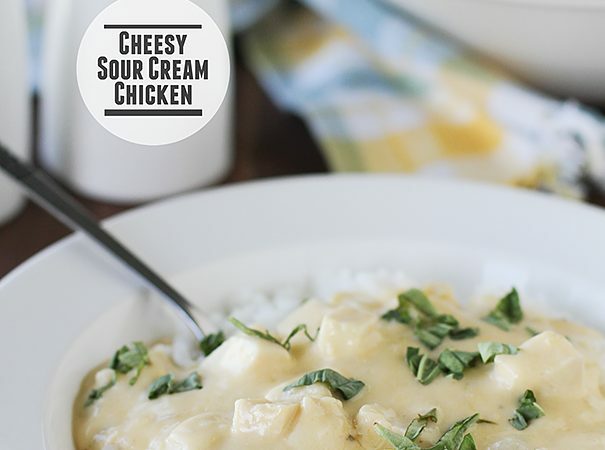 Serve with the basil-peach sauce. I am dying over all the peach recipes. I want to eat this all. Right now! Dear goodness! That looks so beautiful. I might need to make out with it. 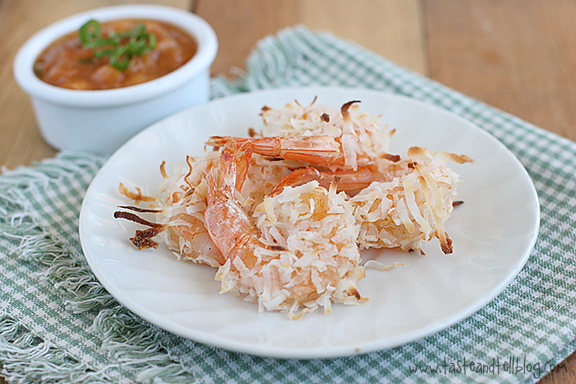 I am SO over the moon for coconut shrimp Deborah! I didn’t even realize how long it had been since I’ve had some. You’ve given me a fantastic recipe to try. Love the photos. Peach and coconut twice in one week?!?!? Sounds like a delicious week to me! Great idea! I’m loving peaches with anything this summer but haven’t tried them with seafood yet! Thanks for sharing! Those are some giant delicious looking shrimp. 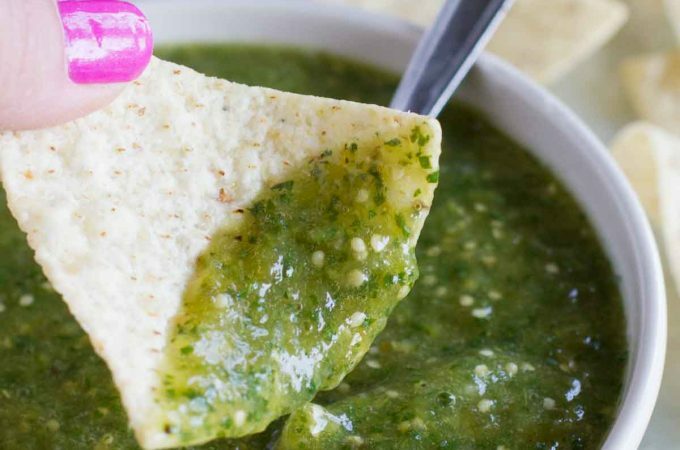 What a great dipping sauce! I also find it so hard to narrow down the recipes when I do theme weeks! Love the pairing of peach and basil for the dipping sauce. 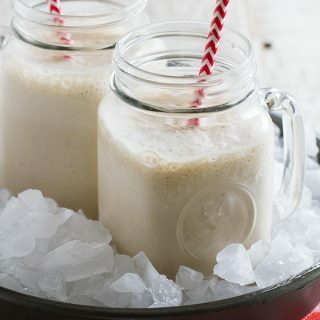 Sweetened or unsweetened coconut ? 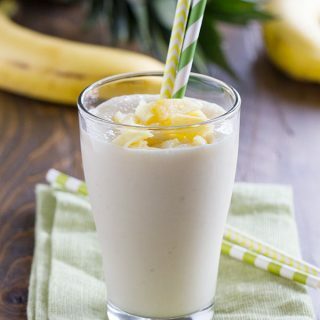 Mel – I used sweetened coconut. I whipped this up on Sunday for dinner and it was absolute shrimp perfection!!! Thanks for sharing.